Purdue understands that funding your education can be an overwhelming challenge, and we work diligently to assist you in helping pay for your education. Specific placement is determined after we have had the opportunity to assess your interest, skills and experience. 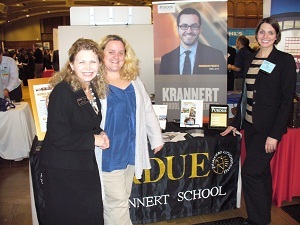 Students also secure graduate assistantships outside of the Krannert School of Management, based upon their special skills and expertise. While Purdue staff does not play any role in identifying potential positions or in the selection of these graduate assistants, we do encourage students to use the resources available to find available positions. There are also opportunities for students to find employment outside of the master’s programs, working for the University or in the Lafayette/West Lafayette area, although these would not include any type of tuition remission.